In this article, I will share 5 examples that will highlight how you can use microlearning-based training. These examples feature innovative learning strategies (videos, scenarios, white-board animation, and kinetic text). Most of the microlearning nuggets featured in these examples support multi-device delivery (that is, they can be accessed from desktops/laptops as well as tablets and smartphones). Discover how Microlearning is a perfect fit for both informal learning and bite-sized formal learning. Before I begin, let me recap the definition of microlearning and where can you use it in your overall training delivery. This is from my earlier article 10 Benefits Of Microlearning-Based Training. Do refer to it to gain insights on why microlearning is gaining momentum and the specific benefits it offers to learners and to businesses. 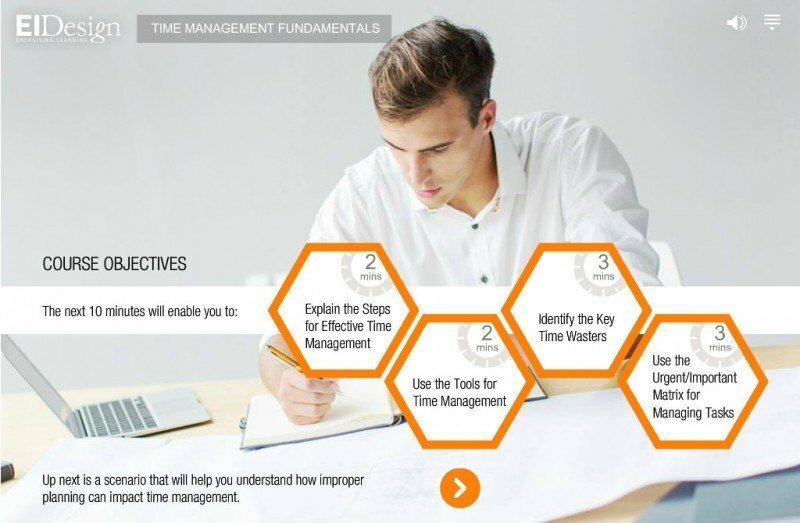 Typically designed and delivered in rich media formats, it is a learner-centric approach that provides just-in-time training that is available on multiple devices (extending to Tablets and Smartphones besides Desktops and Laptops). All these aspects ensure that it can be easily accessed, quickly completed, and applied by the learners. A short intro sets the context of what to expect over the next 10 minutes. The objectives are further broken into 2-3 minute sessions. Instead of diving into theory, the dynamics of the scenario lead the learner to the approach required to mitigate similar challenges. 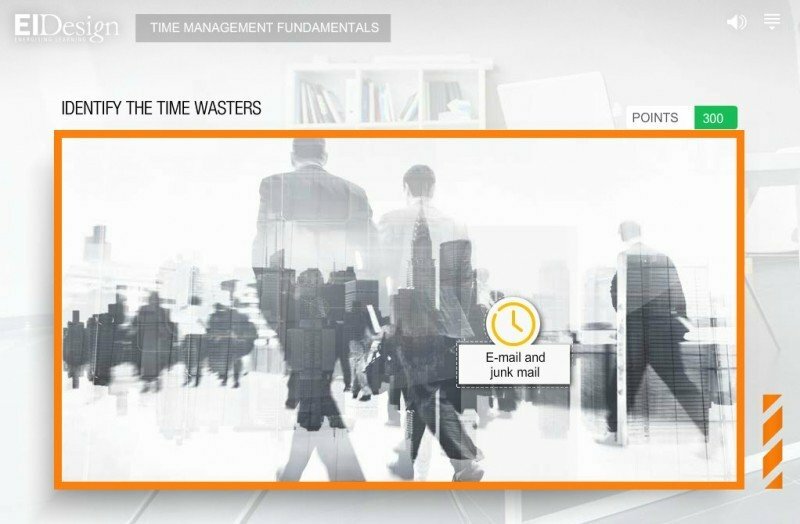 To reinforce a crucial aspect (time wasters), we added a gamified activity. Example 2: Health, Safety, And Environment (HSE) At Workplace (Generic Compliance). 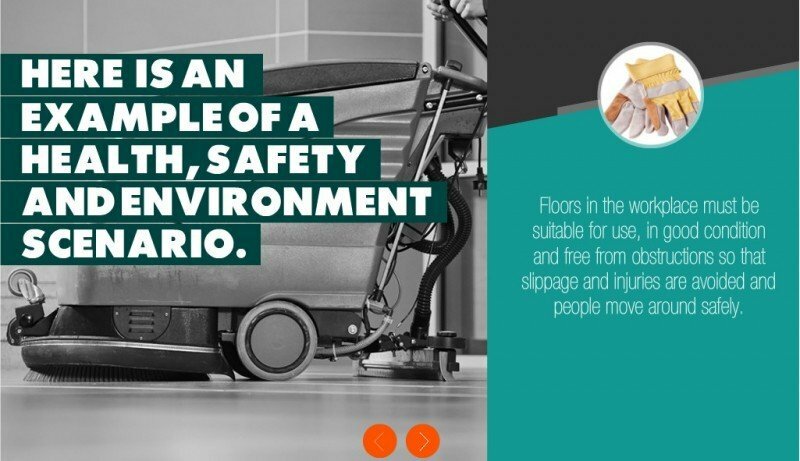 Strategy: This nugget features a video that uses high impact, contextual imagery and recaps the basic aspects of an HSE compliance course. It reinforces the need for constant risk assessment of hazards at workplace. 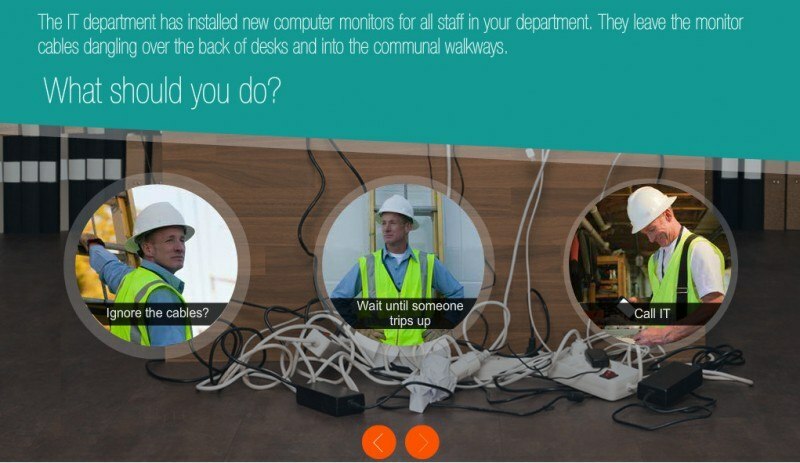 Specifically, it uses a scenario to help learners identify a potential hazard and prompts the right action through the feedback. Example 3: Conflicts Of Interest At Workplace (Generic Compliance). 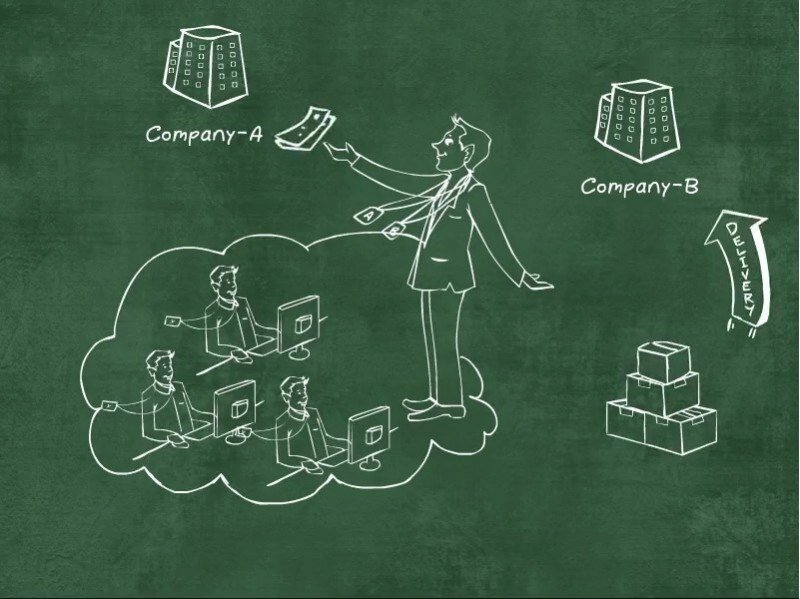 Strategy: This microlearning nugget features a video built using the whiteboard animation technique and features real-life scenarios. 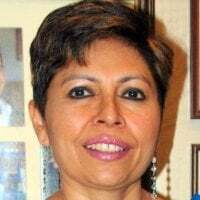 While it re-affirms that conflicts at workplace are common and will occur because of different perspectives team members have, it effectively conveys the importance of identifying these conflicts and ascertaining ways to resolve them. 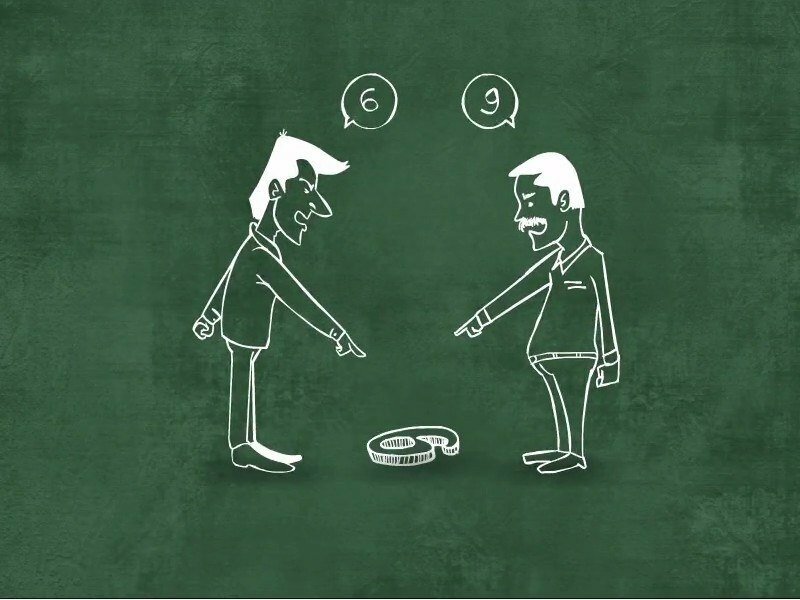 We begin the microlearning nugget with a simple concept of viewing 6 vs 9 to establish that conflicts occur because of difference in perspectives. Then we showcase real-life situations to help learners understand conflicts, their impact, and how can they be mitigated or resolved. 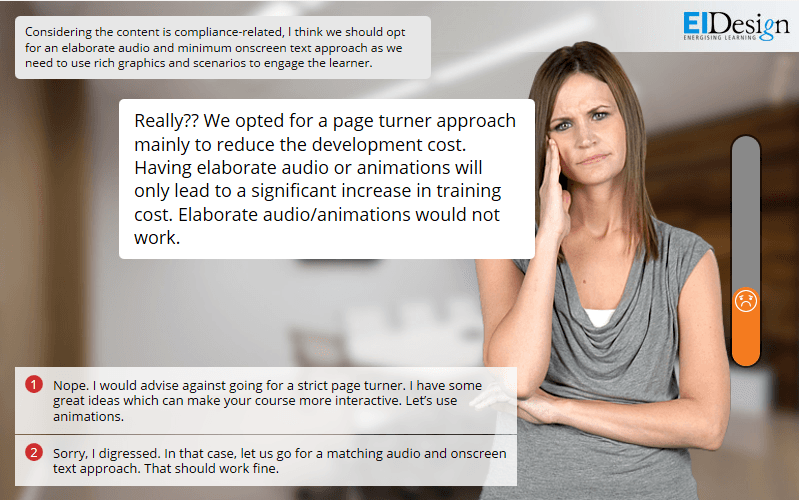 Example 4: Selecting The Right Audio Strategy (Supplements A Suite Of Professional Skills Program For Instructional Designers). Strategy: This microlearning nugget features a branching scenario with a visual indication of how learners fare with the choices they make. The learners are presented with a real life scenario (a project need). Basis the learning of the primary learning course, they need to apply their knowledge and determine the right audio strategy for this project. As you see, the visual indicators constantly provide cues to the learners on how they are performing. Looking at these cues, they can relook at further choices as they move forward. 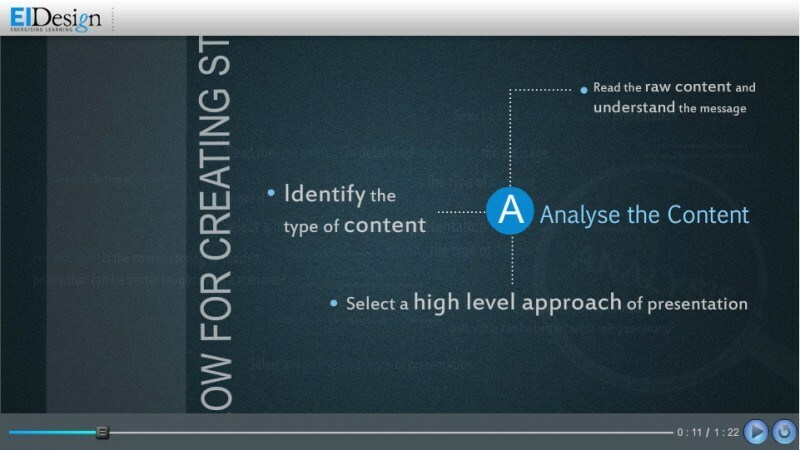 Example 5: Work-Flow For Storyboarding (Supplements A Suite Of Professional Skills Program For Instructional Designers). 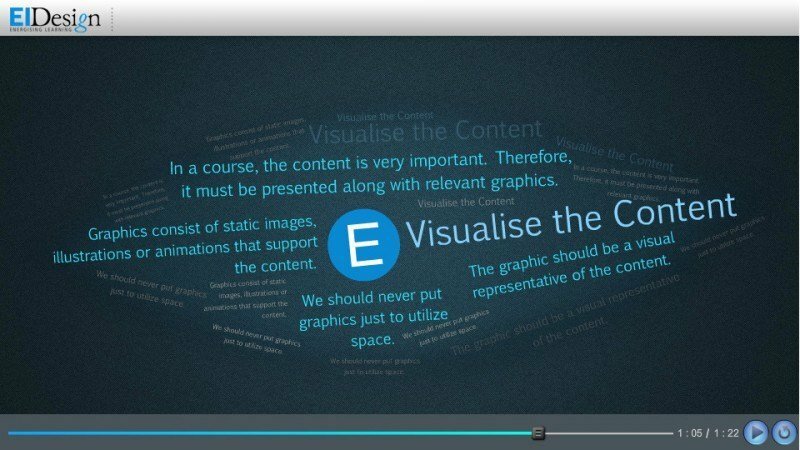 Strategy: This microlearning nugget uses a simple yet effective technique of kinetic text (or text-based animation). This too supports the primary learning course and is aimed at improving the conformance (among Instructional Designers) to the best practices in the workflow to create storyboards. 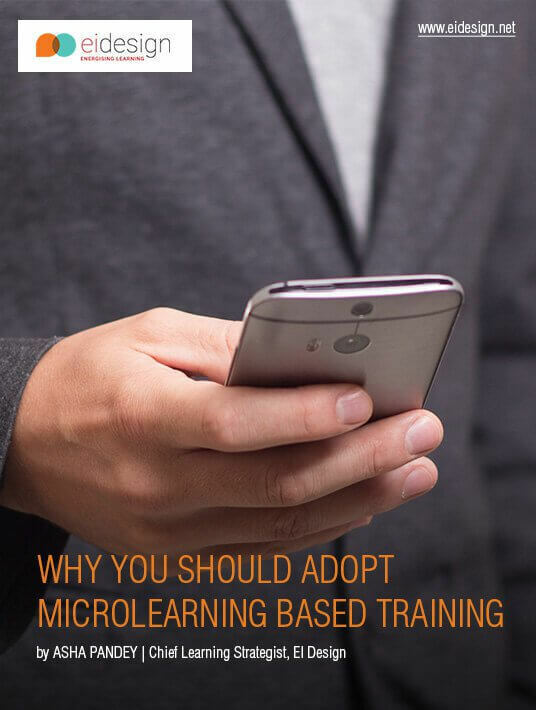 I hope this article helps you evaluate how and where you can use microlearning-based training in your organization. If you would like to know how you can transform your existing training delivery to encompass microlearning, do contact me.